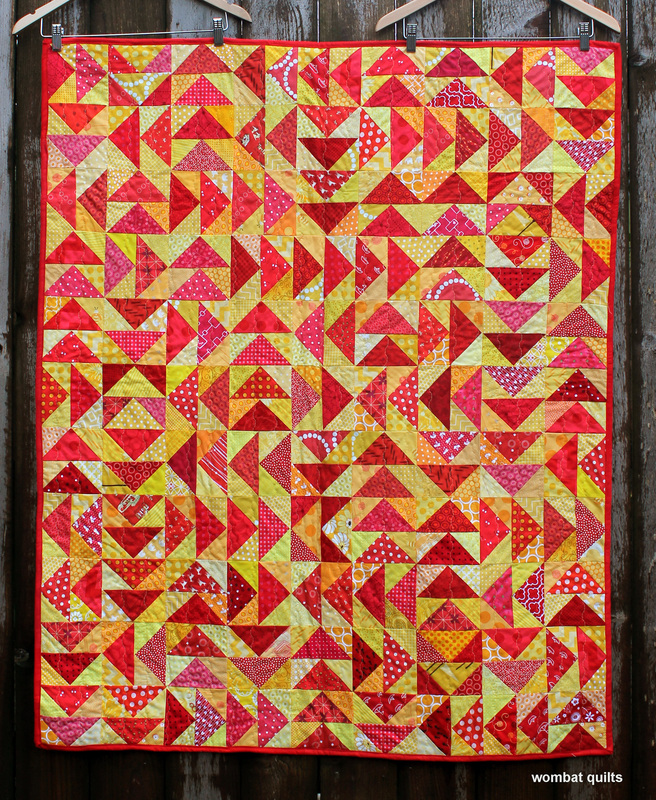 Okay I have a quilt finished…and it is was on my wip list for this year so yeah me! I started this quilt last year but it took me while to finish…and if I am honest I had some help. My fabulous friend Lisa did the quilting on this baby using her wonderful Bernina (I have such sewing machine envy it is ridiculous). 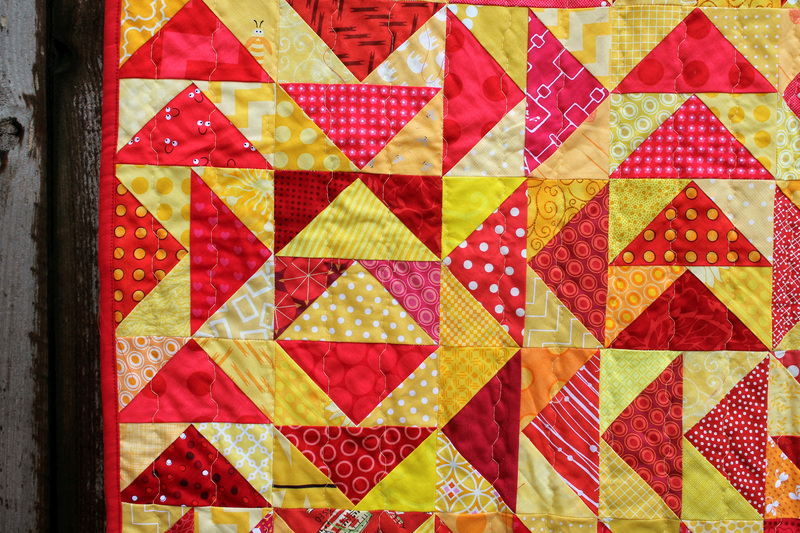 The loud, bright colours of this quilt were inspired by my local Shell Service station (aka. gas station). 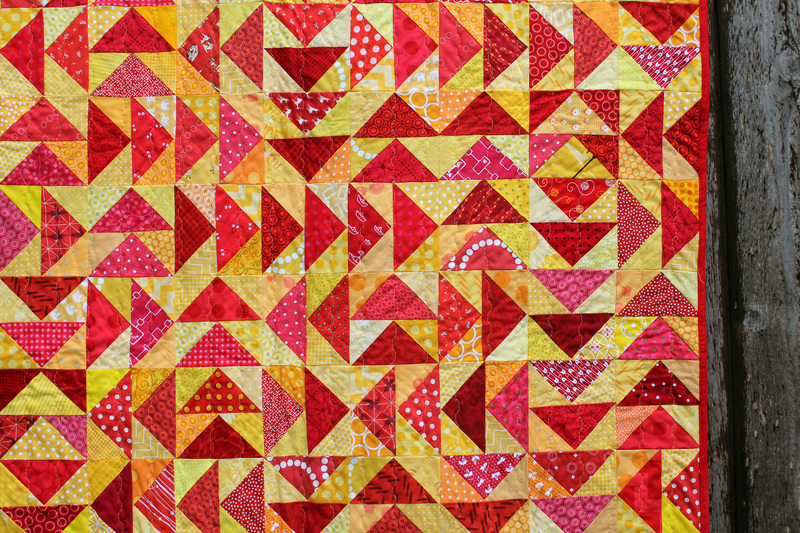 You can find my original post, with the paper piecing pattern I used, here. I must admit I love how the back turned out and it was so easy to do. I used a couple of sheets of my husbands extra large graph paper (I am hoping he does not notice they are missed!) to make a paper pieced pattern and just sewed away.I may be a little addicted now to putting big versions on the block on the back…we will see how long it lasts! 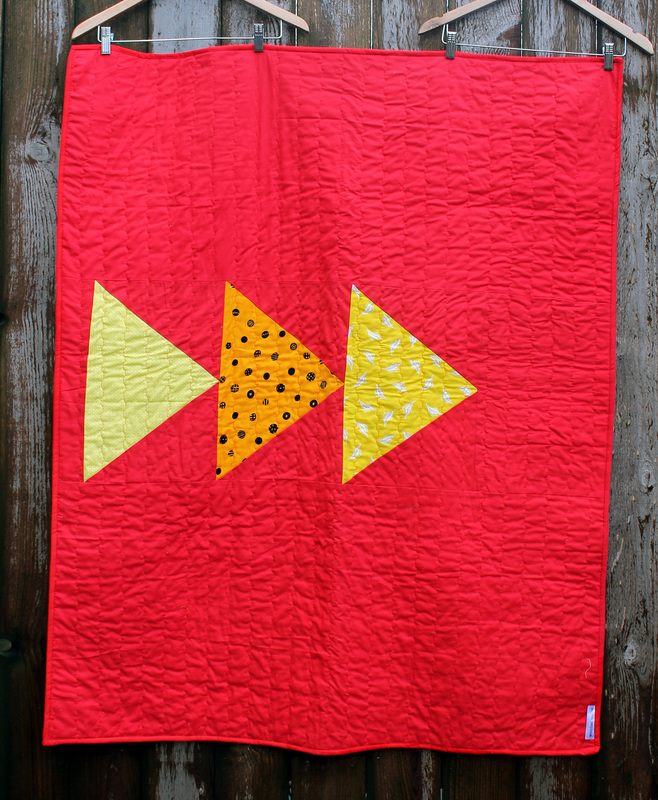 This baby is now headed to Project Linus to be loved on…. Wow, those are some serious flying geese! don’t you hate the trimming? some little jewel will truly love it. The joy of paper piecing flying geese is there is no trimming! love the colors, esp for the middle of winter! I love secret details like the few reversed geese. Most people would never notice they were there, but you know, and it’s fun. Great back, too. Congratulations on the first job of the year ticked off the list! Wow, that quilt zings. Bravo. I adore the bold colours and the flying geese. I have just a similar quilt planned: a project for the rest of the year: yellow and greens! I have already started, but the paper pieced geese sure look a lot easier and less work than the technique I used. I will switch to paper piecing, which I love to do. Absolutely gorgeous! I always find your color choices so inspiring. and I love the way you laid out the flying geese. I liked getting to go back and look for the “inverted” color blocks. What a wonderful gift for some deserving child; I hope it gets lots of love. Beautifully girly! Love your color palette. Congratulations on getting a WIP finished. Always rewarding! I love the bold colours and the back is brilliant! That is so bright and cheerful! Congratulations on the finish! That is unbelievably gorgeous! I love the colors and the way you put the flying geese together! I think you may see many copy cat quilts in the next year or two! I love the bright colors! so pretty! I also love how you did giant geese on the back, beautiful finish! Lovely colors, nice and bright! Wonderful! and love your inspiration ~ it can be found anywhere! When I was a kid we always called a gas station a service station ~ they did all sorts of things for you, from cleaning the windshield, putting air in the tires to servicing your car. I love it! But especially the back! Congratulations on your first finish for 2015! I’m feeling that I should get going on my first sewing for 2015. So I can HAVE a finish this year. 😉 You’ve pretty much convinced me that I have to try paper piecing at some point. 🙂 Love your blog! I already loved this, and then you showed us the back! Fab! Happy first finish of 2015! Have just seen your website and I think it is wonderful. Can’t wait to see more of your work.